Save 10% by ordering 12 btls. Vinformant.com Presents: Summit Lake Vineyards from Jack Scott on Vimeo. 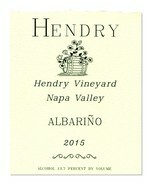 The Hendry family has been farming the same vineyard in Napa since 1939. The lessons learned in more than 75 harvests provide us with a high level of knowledge and a unique connection to the land. The Hendry Ranch is composed of 203 acres situated in the hills north west of Napa, which include 114 acres of vineyard. This latitude and location in the valley experiences substantial marine influence, and allows us to grow 11 different varietals, each carefully distributed among our many vineyard blocks. 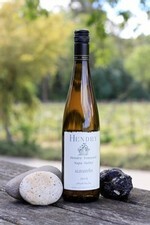 All Hendry wines are made from estate grapes. Our wines are crafted to highlight the terroir of the vineyard. This 100% varietal wine, fermented and aged in stainless steel, is silky and creamy, with a medium body and texture that retains a sizzle of freshness on the palate. Well-balanced, it offers melon, green apple and lemon, with a tease of fresh-cut peach, ending crisp and clean. With his parents and brother, George moved to Napa in 1939 at the age of two. He grew up on the ranch and learned to tend the goats, the cows, the prune orchard and the grapevines. Whether growing grapes, making Hendry wines, or designing cyclotrons, George applies the same tenacity and ability to apply fundamental concepts. 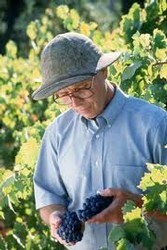 His detailed approach to winegrowing has earned a reputation, and is reflected in our vineyard and our wine.